Image above: VPIRG and TAC held a little celebration for the retirement of the Vermont Yankee nuclear power plant in Vernon, VT. 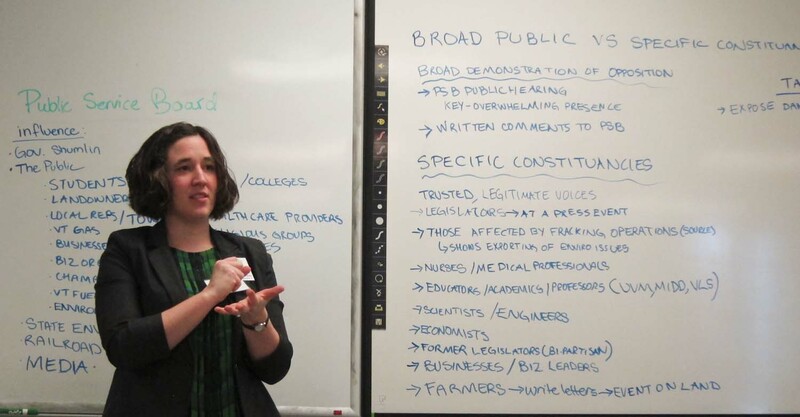 Yesterday was the Vermont Environmental Summit at Randolph Technical College in Randolph, VT. The annual event is cosponsored by the Vermont Public Interest Research Group (VPIRG) and Toxics Action Center (TAC). Gary Hirshberg presented the keynote address. 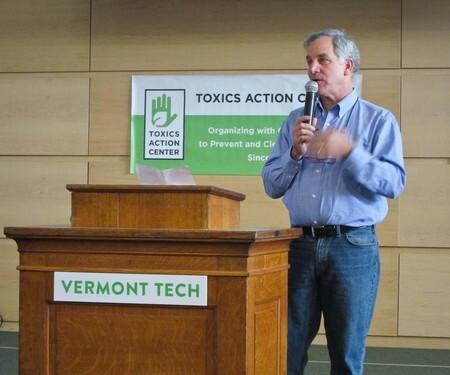 Gary Hirshberg, co-founder and Chairman of Stonyfield Farm, the world's leading producer of organic yogurt, presented the keynote address about mandatory labeling of genetically engineered foods (foods with ingredients from GMOs). Gary is Chairman of Just Label It, We Have the Right to Know, which lobbies for mandatory inclusion on food packaging ingredient lists of a simple acknowledgement that genetically engineered foods are included. You can see his eloquent command of this topic in his TEDx talk here. Paul Burns and Naomi Leary lead a workshop on organizing opposition to a new natural gas pipeline through Vermont. I attended a workshop on one of VPIRG's current projects to prevent the permitting of a new natural gas pipeline through Vermont which will bring gas from western Canada to the International Paper Company in Ticonderoga, NY. 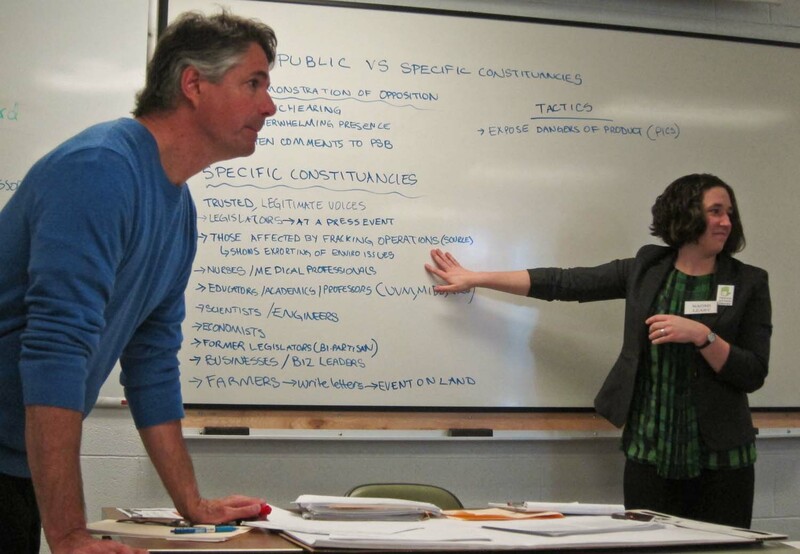 Paul Burns (VPIRG) and Naomi Leary (TAC) gave an engaging summary of their efforts in the form of an articulate "Organizing 101" workshop. It was great to see how experts get this hard work done. At issue is whether Vermont, whose legislature banned hydraulic fracturing in the state, should support the production and distribution of gas which will come increasingly from fracking in Canada and elsewhere. Naomi Leary expertly coaxed the workshop participants to produce the strategy which eventually filled two white boards. I presented a workshop which introduced Public Lab's environmental monitoring and analysis tools. The Prezi I used is below. I learned as my workshop began that I had 90 minutes instead of 60, so I was able to take my time with the zooming slide show and then we had a long time for questions and show-and-tell with my pack full of gadgets. The summit had a "Power Hour" at the end of the day when anyone could offer a one hour workshop/discussion on any topic, so I made myself available for more in-depth exploration of aerial mapping, Infragrams, and spectrometers. I exploited the awesome Public Lab Balloon Mapping Kit box which served to attract someone interested in documenting the multiyear process of decommissioning the Vermont Yankee nuclear power plant. We examined the site in Google Earth and discussed strategies for getting a balloon or kite over the facility to take photographs. Looks good Chris. Nice composite slide of the PL tools.